Typically we think that airlines will segment their customers by class of seating, such as economy class, business class and first class. However, while this gives some indication as to the willingness to pay for additional service and the consumers overall price sensitivity, it does not give us much insight into the consumers’ needs and motivations in terms of their needs for airline travel. 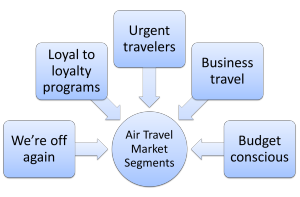 These are non-business consumers that are frequent travelers via airlines. Generally they would be older consumers, perhaps retirees, who have the time and money to holiday quite frequently. Because they are experienced travelers, they are likely to be loyal to a small number of airlines, depending upon their final destination. They would seek some comforts of travel and probably would not choose an airline simply based on price. They would be less likely to research airlines as well, as they are very experienced consumers in terms of airline travel. In fact, they are more likely to be opinion leaders, contributors to Trip Advisor and other similar sites. Therefore, in addition to their frequency of purchase, they are an attractive and important market segment as they have significant ability to influence the purchase decisions of other consumers in the airline market. The second market segment of airline consumers are also quite regular airline travelers. Some may travel for business, but the majority will travel for personal reasons, such as holidays and visiting family. As suggested by their segment name, they are highly brand loyal to a particular airline wherever possible. The prime motivation for their strong loyalty is to accumulate frequent-flier and/or loyalty points, which they can generally redeem for free flights in the future. As a consequence of their brand loyalty, they may form an emotional view of the airlines brand (that is, see them as a very good airline), far less price sensitive and are far less willing to consider alternative airlines. This is an ideal target market for airlines, as they provide a long-term customer base. Of course, the difficulty with this market segment is attracting them in the first place they are far less willing to switch between airline brands. Urgent travelers are infrequent users of airlines and generally represent a fairly small market segment in terms of size. These consumers have an urgent need to travel that is usually unexpected. An example of urgent travel may relate to attending a wedding or funeral, or having a sick relative or having some business/work situation that needs immediate attention. Given their need to travel almost immediately, they are more concerned flight availability and destination requirements, rather than any consideration of price or airline brand. Airlines will typically withhold a handful of seats on each flight in the last few days prior to the flight to be sold at a premium price in expectation that a proportion of consumers will have an immediate need to travel. Business travelers usually form a large proportion of an airline’s domestic customer base. Many businesses have operations in different parts of the country or will have sales opportunities in different cities, necessitating the need to frequently travel by plane. 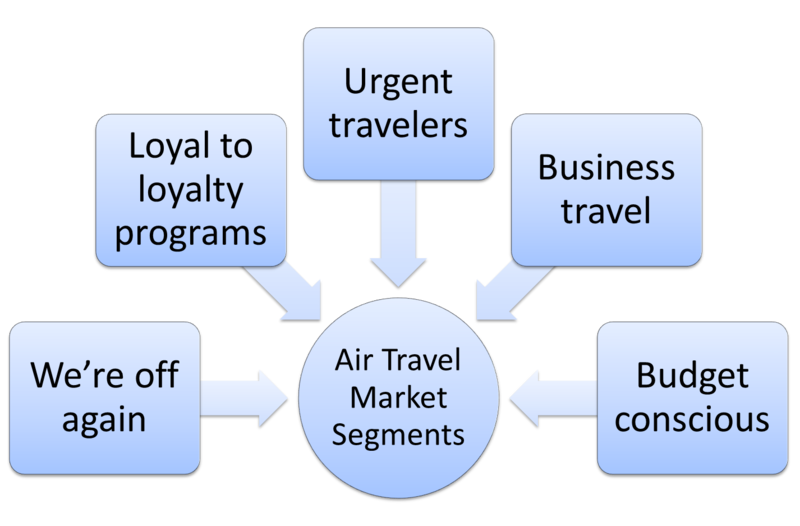 Generally, business customers make an organization-wide decision as to the choice of airline, rather than the individual traveler being involved in the purchase decision. As indicated by its name, many businesses choose travel business class, particularly for employees expected travel frequently or for management and executive level staff. Needless to say, this market is relatively brand loyal to an airline and is quite price insensitive. As a result, it is common for the airline to arrange a contractual deal with larger businesses, organizations and even government bodies in order to win a significant proportion of this business on an ongoing basis. Budget conscious air travelers tend to be more infrequent travelers and holidaymakers, or consumers who perceive little difference between airlines. However, consumers who see little difference between airline offerings will simply aim for the cheapest price, as it represents the most value for them, given they see no extra benefits attached to any particular airline. In terms of this market segment, it is important to remember that some consumers in this segment low income earners, but other consumers are simply using price as a point of differentiation in their purchase decision.